The first dock built at Port Talbot was completed in 1837 and became the first properly constructed dock along the coast of South Wales. Substantial enlargements were completed in 1898 when the Port Talbot Railway & Dock Company was formed to provide improved facilities. But as the 20th century wore on it became clear that the docks were unable to accommodate larger vessels. In 1966 work began on a new deep water terminal and the new harbour was opened by Her Majesty the Queen in 1970. The old Port Talbot Docks closed at the same time. However the docks were not yet finished- they re-opened for business in 1998 with the unloading of a shipment of processed slag and have continued since then with other cargoes such as steel and timber. Most dock and railway companies maintained a police force to protect their interests and maintain law and order and it is more than probable that the Port Talbot Railway & Dock Company did too. However, along with numerous other small dock and railway companies, and their police forces, the PTR&D company disappeared in the amalgamations of 1922 when it was taken over by the Great Western Railway Company. Policing was then provided by The GWR until 1948 when further amalgamations resulted in British Railways being formed. A new national police force was formed, The British Transport Commission Police, which continued until 1963 when the force changed it’s name to become known as the British transport Police, as it is today. The police service was withdrawn from the ports around the country in April 1985. In August 1940, as with all the ports of South Wales, many special constables were taken on at Port Talbot for the duration of hostilities, with nineteen being taken on in the first instance. Within six months the port security officials publicly commented on the manner in which these special constables were carrying out their duties and preventing unlawful access to the protected area. As a result of the increase of manpower, several full time constables had been appointed acting sergeant, amongst them was Acting Sergeant G. Davies. In November 1943, Acting Sergeant Davies was commended by the court for his diligence in arresting an armed youth. The officer was a non-swimmer and yet he had waded out into the sea up to his neck in order to make the arrest. 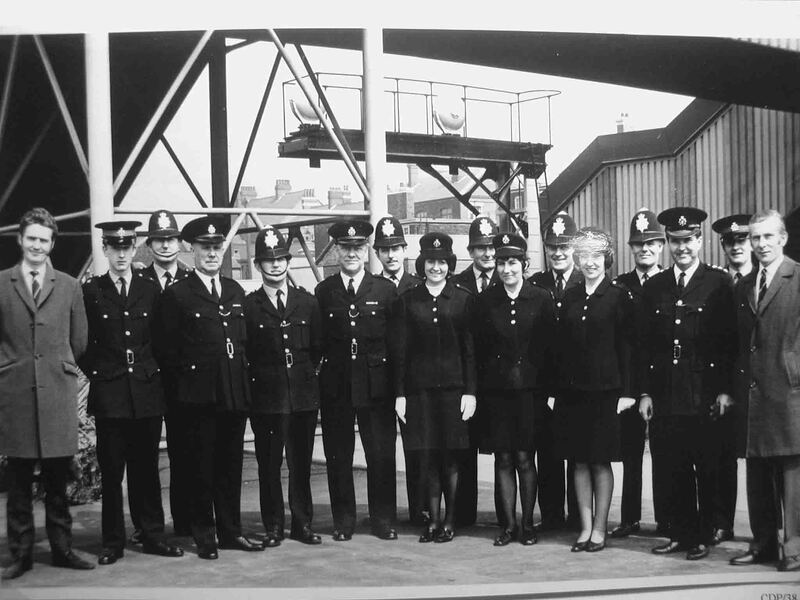 The opening of the new tidal harbour by the Queen was a major security event for the British Transport Police, under the command of Superintendent William Voyle. Officers were drawn from police stations across South Wales. The photograph shows some of these officers with Chief Inspector Tom Buckle third from the right. The Scottish-born industrialist Sir Ian McGregor was one of the key figures in the miners' strike of 1984. He and National Union of Miners (NUM) leader Arthur Scargill could not have been more different. They were protagonists, and during the course of the year-long dispute, although they tried several times to negotiate a settlement, they disliked each other so much that the meetings all came to nothing. One of the strategies the striking miners used in South Wales was the mass occupation of giant cranes on the deep water iron ore berth at Port Talbot Docks. It was, on the face of it, a high profile exercise intended to last several days and attract maximum publicity through peaceful process. The police on the other hand, were always going to view the occupation of the cranes as unlawful, a view reinforced when it became apparent that the miners had armed themselves with nuts and bolts and scaffold clips ready to throw them down on anyone trying to ascend the crane after them. In the early hours of Thursday 30th August 1984 one hundred and three striking miners in a variety of cars and vans forced their way past the security check point, drove onto the jetty and swarmed up the ladders of the three 120 feet high cranes. The police response was to put a cordon around the cranes and the jetty and begin negotiation; there was no question of any attempt to remove the men by force. Electricity to the cranes was cut off and all the tyres on the miners cars were deflated to prevent a rushed escape. British Transport Police Assistant Chief Constable (ACC), Ian McGregor took charge of the operation and planned a phased resolution. Sergeant Colin Bryan was in charge of one the BT Police Mobile Support Units and had been working twelve hour shifts from 3am to 3pm for weeks, working both at Port Talbot Docks and in the Gwent valley covering railway bridges when miners who were still working were being bussed into the pits. When the unit signed on duty on the morning of the occupation they were sent straight to Port Talbot Docks to form part of the cordon. Officers were brought in from across the country including a Mobile Support Unit from London under the command of Sergeant Randy Otter. Moored on the jetty was the bulk carrier Argos carrying 30,000 tons of American coal being imported to keep the South Wales steel works in production during the strike. The ship and her cargo was a thorn in the side of the miners and was the main reason for their occupation of the site. Amongst other things, the miners were threatening to cut the ship’s mooring lines, so Sergeant Bryan and Police Constable Gould were sent to the end of the jetty to protect the stern lines. The officers were obliged to use the walkway underneath the jetty to avoid the threat of scaffold clips and other projectiles being thrown down. What nobody had foreseen was that the tide came in and covered the walkway below the jetty and the officers were stuck there until the tide went out again. And, needing to get statements from the ship’s officers, the CID also had a bit of an adventure because the only way they could get on board the ship while avoiding the scaffold clips was to use the pilot boat to take them to the far side of the vessel and to scale a ladder up the ship’s side. ACC Ian McGregor decided to go up the crane and talk to the miners face to face, even in the face of threats to ‘throw him off’. Despite the fact that the ACC was a very fair-minded man and not unsympathetic to the miners cause, they were not exactly endeared to him if for no other reason than he had the same name as the despised Chairman of the Coal Board! But it was not ACC McGregor’s tenacity that brought the matter to an end, it was that old policeman’s friend, the weather. Friday night brought torrential rain and gale force winds, making the top of a 120 foot high crane a thoroughly miserable place to be. In the morning, the miners gave up and came down. Each one was met by his own personal arresting officer and all were taken off in buses to various police stations to be charged with Unlawful Assembly. Despite the potential for violence, none of the miners or policemen were injured during the 48 hour occupation, perhaps indicating a measure of restraint on both sides. The men were kept in custody until their first appearance at the Magistrates Court. With so many defendants and feelings still very much running high, a public order situation was anticipated and it was left to the British Transport Police to ensure that order was maintained both inside and outside the courtroom. Sergeant Bryan’s Support Unit and many other officers were in attendance and in the event there were no serious disturbances. The defendants were allowed bail and were eventually dealt with at Swansea Crown Court on the 27th June 1985 before Mr. Justice Leonard. With such a large number of defendants, one hundred and two, (one man had died in the meantime) they were dealt with in batches over a five day period. All the defendants pleaded guilty and most were sentenced to six months imprisonment, suspended for two years. The case is widely believed to have made British legal history for the largest number of persons ever charged with a single offence. It was also quite possibly the last major incident ever dealt with by the British Transport Police at any of the ports it policed. The force was withdrawn from all the ports nationwide just seven months later. ACC Ian McGregor and three other senior officers were commanded by the Judge for the restraint shown and the manner in which the operation was dealt with.